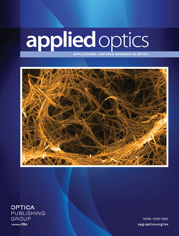 The authors are with the Department of Optoelectronics, B6,26 Room 3.16, University of Mannheim, D-68131 Mannheim, Germany. In a multimode step-index fiber the propagation angle of a beam is conserved over short distances even if the fiber is bent slightly. This behavior can be exploited for a multiplexed signal transmission by the assignment of different channels to different propagation angles [angle-division multiplexing (ADM)]. Thus parallel transmission can be achieved. Because each channel occupies only a subrange of the fiber’s numerical aperture, modal dispersion is reduced compared with single-channel transmission through the same fiber. The transmission properties of an ADM-based transmission line are analyzed for short propagation distances. Passive all-optical setups for multiplexing and demultiplexing operations are proposed. Cross-talk measurements are shown for a transmission with a length of 8 m and 13 multiplexed channels.